I had some time to do some adult reading this weekend. I finished THE MISTRESS'S DAUGHTER by A.M. Homes. This is Homes' memoir revolving around her adoption, the relationship she has with her birthparents in her 30's and her feelings during the time. It is a powerful book. I have not read anything else by Homes but was drawn to this one from a review in an adoption magazine. Although the focus is on adoption, it is bigger than that. It is a book about a 30/40 something woman finding out who she is. Something very universal. I highly recommend it as a great memoir for adults. A.M. Homes has some great lines of hope throughout the book. She seems like an amazing person who has a great sense of who she is. The story is not really a happy one--it is a journey filled with lots of struggles. The honesty with which she tells her personal story makes it a great read. I have just recently started to read memoir. I plan to read lots more. There is an interview with the author on her website--about the struggles in writing a book that was not easy to write. Daemon roundup is at Wands and Worlds. 17 Kidlitosphere Daemons gathered in one spot. Some have not settled down yet. Mine has. If only her name was Charlotte, she might not seem so creepy. Go here if you don't have one yet. What are you waiting for? Cool time coming up: At three minutes and four seconds after 2 a.m. on the 6th of May this year, the time and date will be 02:03:04 05/06/07. This will never happen again. At Worldometers you can see world statistics updated in real time. Watch the tickers spin on how many calories have been consumed this year and the dollars spent on dieting in the U.S. Change your computer's clock to some year in the future (they suggest 2050) and check out the projected statistics.
' “Your IQ has really no relationship to your wealth,” says Jay Zagorsky of Ohio State University...' Anybody want to try to answer this one: "If you're so smart, why aren't you rich?" Maybe this graph from Indexed holds part of the answer. I have at least three spots in my office for books I've bought/received but haven't read yet. Today I'll be selecting from the pile on top of this shelf rather than the pile on the top of that shelf, and rather than that entire shelf over there, or that other 3/4 of a shelf down there. Volumes 6-8 of HIKARU NO GO. I read Volumes 2-5 over spring break. It pleases me that after I finish these, I will have read an entire manga series. RULES by Cynthia Lord. I know, get with the program. HOW TO CHEAT A DRAGON'S CURSE by Cressida Cowell. I love this series. I think it deserves more attention. DANDELION WINE by Ray Bradbury. Last month's book club book. I'm not skipping it, I just couldn't make it happen last month. LOVE, RUBY LAVENDER by Deborah Wiles. The long-standing literature circle group finally finished THE SECRET GARDEN and they voted unanimously to finish the last two books on our list even though we only have about 5 weeks of school left. RUBY LAVENDER is a nice change after THE SECRET GARDEN. Why is this so close to the top of my pile when I've already read it twice before? I, too, need a change after THE SECRET GARDEN. And a dose of Wiles to get me ready for her new book coming out in August! 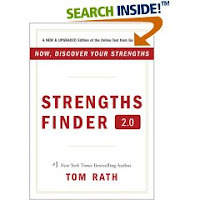 STRENGTHS FINDER 2.0 by Tom Rath. Yeah, I know: yawn. But I got it two months ago at a leadership training seminar for Ohio Casting for Recovery, so it's the one that's the most overdue to be read. I'll take it, and RUBY LAVENDER as incentive to finish it. When I get home, I'll go online and to the Strengths Finder Assessment. It'll be interesting to see how this compares to my Daemon! If you read my last couple of posts (minus the Daemon), you might wonder if I'm counting the days to retirement. Not even close to that! But some days I do need something to sustain the courage to teach my way until the moment when, just to use a recent example, a student compares me to Mo in INKHEART. Or some such. This little book of poems and essays has kept me going more than once. "Teaching with Fire is a glorious collection of the poetry that has restored the faith of teachers in the highest, most transcendent values of their work with children....Those who want us to believe that teaching is a technocratic and robotic skill devoid of art or joy or beauty need to read this powerful collection. So, for that matter, do we all." "When reasoned argument fails, poetry helps us make sense of life. A few well-chosen images, the spinning together of words creates a way of seeing where we came from and lights up possibilities for where we might be going....Dip in, read, and ponder; share with others. It's inspiration in the very best sense." ...but I agree with the qualities. Well, you get what you deserve. No cute kittie for me! Today was Let Your Child Skip School Day Take Your Child to Work Day. Instead of 25 students, I had 12. It was the perfect day to share the book Once Upon a Banana, by Jennifer Armstrong (illustrations by David Small). In this wordless (except for street signs) picture book, a monkey escapes from a street performer, steals a banana from a grocer's outdoor display, drops the peel on the sidewalk, and, well, you probably know the rest. One thing leads to another and then another. We had great discussions from the very beginning. The monkey escapes in the end papers, the banana is stolen on the title page spread, and the monkey scampers away from the street performer while he is detained by the angry grocer on the copyright page spread. "It's like an...introduction," I said. "No, a PROLOGUE," corrected one of the students. As we read on, they made inferences based on facial expressions and body language, made predictions, and used the terms "cause and effect" and "point of view." Then, right when the judge who accidentally stepped on the skateboard runs into the lady with the baby carriage, my Firecracker who was tipping in his chair fell, knocking his desk over, and dumping its contents on his head. They thought it was hilarious (and no one more than Firecracker himself, who was not injured in the least) that this had all happened at the moment in the book when there's the most chaos. And then someone brought up the time when I was reading BLOOD ON THE RIVER and the character Samuel punched the character Richard in the mouth and Richard lost a tooth. At that very moment, one of my students lost a tooth. At the time, we went, "Ooooh, ahhhh," because it was like I made my student's tooth fall out. But now it happened again. "It's just like in INKHEART!" one of my super girl readers said. After we explained to the rest of the class about Mo being able to read book characters to life, one of the boys commented that I better not read aloud any books with guns and killing. "But I already have," I replied. (BLOOD ON THE RIVER currently and DANGER ALONG THE OHIO last year) "I must only be able to read into life things that could happen in a classroom." "Read a story about cookies!" tooth-loss boy cried out. "Read a book about Christmas!" begged another. I, for one, am sick and tired of those high paid teachers. Their hefty salaries are driving up taxes, and they only work nine or ten months a year! It's time we put things in perspective and pay them for what they do...baby-sit! We can get that for less than minimum wage. to pay them for any vacations. What about those special teachers or the ones with master's degrees? Well, we could pay them minimum wage just to be fair. Let's round it off to $6.00 an hour. That would be $6 X 5 hours X 25 children X 180 days = $135,000.00 per year. Wait a minute, there is something wrong here!!! Teachers would earn more if we just paid them to baby sit!! I checked out some of the buzz about this book before I read it. (see below) Based on what I found, I knew I was in for a story with two distinct voices, a tight plot line, and a unique style. I also knew that Emma-Jean doesn't use contractions when she speaks, and that I might be tempted to compare the book to THE CURIOUS INCIDENT OF THE DOG IN THE NIGHT-TIME, by Mark Haddon. Everything I'd read was true. Except I didn't think of Haddon's book, exactly. Rather, I thought of the phrase "spectrum disorder" when I tried to make sense of Emma-Jean. There is, however, nothing disorderly about Emma-Jean. She is logical, scientific, distant from her peers, and very, very organized and clean. She is unlike Colleen, who is a fairly typical 7th grade girl: self-centered (but trying really hard not to be), obsessed with what others think of her (but trying really hard not to care), and way smarter and better than she ever gives herself credit for being. And Emma-Jean is practically the polar opposite of Laura, who is the alpha female of the seventh grade girls (popular, powerful, cheerleader). Along with these archetypal 7th grade girl characters, there are boys that range from tall, blond athlete Will to Brandon the bully/buffoon. Almost as soon as I thought of the phrase "spectrum disorder," I realized that Lauren Tarshis had not so much told the story of one character who was vastly different than "normal," but rather, she had given us a set of characters in this book whose behaviors ranged in a spectrum from Emma-Jean on one end, to Laura on the other. My favorite character in this book is actually the janitor. Out of all the students and adults at the school, I think he is the one who understands Emma-Jean the best. He knows ALL of the kids the best -- all the variations on the spectrum of what constitutes middle school behavior. He takes care of Emma-Jean, and he "takes care" of Laura, both in very satisfying ways. He reminds me of our janitor, who, for some of the kids, is the most important (caring, accepting, non-judgemental) adult in the building. I asked one of my 5th grade girls to read this book. She's a fabulous writer who has incredible voice in her writing. She really liked the way the author told the story from two points of view, and made each so distinctly different. I asked her if she knew any kids in our school that reminded her of Emma-Jean or Laura. I can think of some, but she thought that both of those characters were a bit extreme -- "creative" or "bossy" characters that you could find in books, but more over the top than any kids in real life. She could think of several girls in our class who are like Colleen, however. I'd be curious to know how real the characters in this book are to readers of other ages. 7th grade was kind of a long time ago for me, but even so, I can remember characters in my class like all of the ones in this book...except Emma-Jean. As an adult, I have met/taught some "Emma-Jean"s. How about you? Do these characters all seem real to you, or are they book character stereotypes? Have your 7th graders read this book? What do they think? Does it ring true for them? 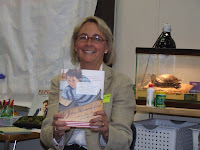 What a lucky day we had today--Louise Borden came in to our class and read her new book to us--THE JOHN HANCOCK CLUB. This is a great story of Sean, a third grader, who is not so excited to learn cursive handwriting. 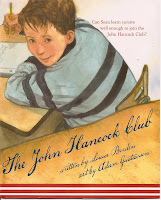 But with the help of his teacher, Mrs. Tovani, he learns to have excellent penmanship and to join the classroom's John Hancock Club. Louise Borden weaves in facts about John Hancock as the students learn about him and his signature on the Declaration of Independence. Louise Borden has once again captured life in a great classroom. If you don't know her other school books, you'll want to check them out. THE DAY EDDIE MET THE AUTHOR is a story of a boy who gets to meet an author during an author visit at school. GOOD LUCK, MRS. K! is the story of a classroom of children and their support of their amazing teacher who is diagnosed with cancer. THE LAST DAY OF SCHOOL captures the feeling of kids and teachers on that last day of school--the excitement of summer but the sadness of a good year finished. A great one for this time of year! YAHOO! Mother Reader's 2nd Annual 48 Hour Book Challenge is Coming Soon! We missed this fun weekend completely last year. But, this year, it looks like we might be able to participate a bit! The weekend is perfect for us (we hope!). Our last day of school is Thursday right before the challenge. What better way to spend our first few days of summer than to read for 48 hours!! If you don't know about this fun, check it out on Mother Reader's website. I was amazed at how many books people could read in 48 hours. I have no intention of trying to win but what a fun great excuse to sit around and read for the whole weekend!! A great time to catch up on that huge pile of books that you've been meaning to read. Trying to get my family to do it too. A quiet house would be so much easier to read in, don't you think? Wonder if there is a way to get the kids in our class to participate if they want to? I have been waiting for this for months! Let the piles begin! 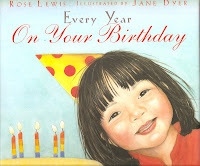 EVERY YEAR ON YOUR BIRTHDAY by Rose Lewis is another great adoption story that I just picked up. I love it when I find a great new story about adoption. This one is a kind of sequel to I LOVE YOU LIKE CRAZY CAKES by the same author. Two great books that are part of our home library. Jane Dyer also illustrated both of them and the illustrations add to the celebration of the story. In this story, the mother reflects on her daughter's birthdays and how quickly she is growing up. She weaves a love of her birthfamily and her birth country (China) throughout the book. It is a happy book celebrating life, birthdays, adoption, and family. I am noticing that my daughter is outgrowing some of the adoption stories since so many are about the child's actual adoption. But, this book celebrates adoption beyond the actual adoption "event". I am hoping to find more books like this in the future for our children who want to see themselves in stories beyond the typical adoptions story--if that makes any sense at all. This one celebrates the child's life as she grows up, weaving in the fact that her birthfamily and birthcountry are all part of who she is becoming. Fruity Cocktails Count As Health Food, Study Finds. "The study did not address whether adding a little cocktail umbrella enhanced the effects." Monica has a fun piece of fiction (I hope?) inspired by a quote in the New York Times. Read Roger had an insightful post about this new world of blog reviews. He made interesting points that we hadn't thought of...mostly because we have never been in the world of professional/print book reviewers. We have, however, always read reviews. They help us choose the books that are worth reading. Then we can decide if and how we will add them to our classrooms somehow--as a read aloud, in the classroom library for independent reading, etc. F: I worry when I review a book because I understand that I am reviewing with the eyes of a reading teacher and a mother. But, when I sat back and thought about it, I have been reviewing books for years as part of workshops that I do with teachers. Part of every session is about good books for the classroom. In fact, I don't think I really consider the things I write "reviews." They are just my thinking/my sharing of the books with other people who might like them. They are no different from me talking to friends about books I like. I don't think I have the expertise to critique a piece of literature but certainly trust those who do and I count on them for lots of my reading. I think each person reads reviews differently--knowing who wrote them and their take on books. There are some books that are not great quality, but they somehow turn that one child into a reader. There are others that deserve a closer look. For years, I didn't like when my kids read lots of series books that weren't well reviewed. Now, I know that getting hooked on a series, regardless of the quality, is a huge step in the life of a reader. ML: For us, that pairing of a child with a book, or our class with a book is one of the most important reasons why we review/share about books. Roger says that children's voices are still missing in this flood of reviewing that's going on in blogs. True, reviews written by children are not a big part of the Kidlitosphere. (Don't discount the blogging work Educating Alice's students are doing, however, or the guest reviews by MotherReader's daughter, or all the children who write reviews on Amazon.) And while Franki and I write all of our reviews, all of our reviews are written with children in mind -- whether we are imagining how we will use the book with our whole class, or whether we know just which child/group of children might like it. In addition, we often include student insights in our reviews. We're not the only ones: Miss Rumphius works dilligently to keep children's literature at the heart of all her pre-service teachers do, Wild Rose Reader shares children's work with poetry as well as teaching ideas for the poetry books she reviews, and Mentor Texts highlights students' writerly connections to children's books. Like Franki said, what we write aren't so much reviews as they are book talks. They certainly aren't written by "putatively disinterested experts." But that's what makes them so valuable. They are written not just about the book, but about the book's potential real life experience in the hands of children. Thank you, thank you, thank you to HarperCollins and Cover to Cover Children's Books for sponsoring Angie Sage's day with our 4th and 5th graders. Angie Sage is the author of the Septimus Heap series, a fantasy series about the seventh son of the seventh son in a family of wizards. In the first book, MAGYK, we meet the Heap family, Marcia (Mar CEE uh) Overstrand (the Extra Ordinary Wizard), and Aunt Zelda (a white witch). Knowing that the series is named for Septimus Heap, readers will not believe that he actually dies in the first chapter, but their questions about him will not be fully answered until the last pages of the book. I listened to this book while driving to and from school, and I often found myself either wishing for a longer commute, or sitting in the parking lot/driveway unable to stop listening! The British accent of the reader definitely added to the experience. I read FLYTE with my eyeballs (instead of my ears), and it was just as delightful as MAGYK. If you were paying attention in MAGYK, you know exactly who the dark stranger is at the beginning of FLYTE, but again, it takes the whole book for the mystery to unwind. In the meantime, there is new evil with which to contend, and some old evil comes back in bits and pieces. The green rock that Jenna gives to Boy Four-One-Two in MAGYK surprises everyone and causes quite a stir. I ran out of spring break before I had a chance to read PHYSIK, but it is top on my list for summer vacation! From what Angie said about it in her presentation, I am expecting some time travel, and a new avocation? vocation? for Septimus. One of the perks of the dust jacket of the hardcover of PHYSIK is that the reverse side is a map of the world of the series. All three books include maps, something Angie said is very important in imagining, writing about, and reading about an imaginary world. It is one of the ways that world comes to life in the mind of the author and the reader. In this picture, Angie (who I think is equal parts spunky Marcia Overstrand and gentle Aunt Zelda) is sharing the matchboxes she creates for each of her books. She fills the matchbox with small cards upon which are written the name of one character in the book. When she gets stuck in her writing, she takes out the cards and uses them to visually see the connections between the characters and to get ideas to help the story move along. Her presentation gave the children a fascinating insight into the ways a writer's world and life make their ways into her books. She showed us a satellite picture of her home in Cornwall, England. The whole bottom section of England was shrouded in fog, which was visible from space. How perfect that fog features strongly in her stories! In another, she showed us some big helicopters flying over her town (there is a naval base nearby). While she didn't make the connection at the time she was writing, she now sees that these helicopters are like the dragons in her stories -- and now as then, everyone looks up when one flies by! She showed us the old woods near her house, and the narrow winding channels of the creek near her house. In her books, the woods became deeper, denser, and bigger, and the creek channels became the Merrim Marshes. The day before Angie visited, our fourth graders performed the dress rehearsal of their spring program for the whole school. The theme was, "The British Invasion," and the songs and movements they learned were all from the British Isles. The first song they sang was "God Save the Queen." I couldn't believe my ears! The perfect welcome for Angie Sage! Here you see our (fabulous) music teacher leading the fourth graders in the first two verses. Angie was touched and impressed. Most Brits, she said, only know the first verse, so to hear 10 year-olds in the U.S. singing TWO verses...well, the same would be true if we traveled abroad and heard a group sing all the verses of "My Country 'Tis of Thee." Here's a small indicator of the impact of Angie's visit on our students: I had announced that I would end the book sale the day before her visit (so that the autographing schedule could be locked in). Despite this, at least one child brought money for a book on the day of the visit, and I knew the books would still be in my room for at least a couple of days after the visit, so I let the teachers know that the sale would continue the next day(s), but without, of course, the opportunity for autographs. Half again as many books were sold the day after Angie's visit than were sold in the weeks before. Clearly, Angie and her books inspire readers! Lucky for us that we got to experience the "magyk" of Angie Sage! See why I had to buy this book! I am not a fan of bugs but I love this book. A great addition to our classroom poetry collection if I must say so myself. I love the size. It is very, very small. The poems are all fun and short. A great sense of humor. I am pretty sure the kids in my class will love it. They will certainly love the topic of bugs and the writing will give us lots to talk about. The black and white illustrations are also perfect--they remind me a bit of the illustrations in Valerie Worth's all the small poems. The illustrations are perfect for the poems. 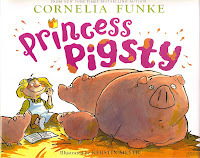 This is the newest (I think) book by Cornelia Funke. I became a fan when I read INKHEART and DRAGON RIDER. But, I have also come to love her picture books. Her nontraditional approach to princesses makes me happy. Princess Pigsty is the story of Princess Isabella. Princess Isabella's mother, the queen, thinks that "Our children must be the happiest children in the world" since they have servants who do all of the work and always have something soft to sit on. But Isabella isn't happy. She is curious and she want to be dirty AND she wants to do things for herself! A great story about a princess with a mind of her own who teaches everyone a good lesson about being happy! Suddenly the hunters came riding out of the trees on their horses, shooting their guns, and shot a lot of the bison. Even the young one. And after that there were practically no bison left in North America. "That's the end," Barry said. "It's a sad ending." "Some stories have sad endings," Gooney Bird announced. It's good to be reminded of that. Tricia raised her hand. "But what's the moral?" she asked. Barry stood in front of the class with his arms folded across his chest. He thought and thought. "Guns make a mess of things," he said finally. Tyrone looked down at his lunch, a pear and a sandwich on a paper napkin in front of him. He thought for a moment, the chanted, "Ain't no pear as big as my hair, cuz pears be small and my hair be tall..."
Mrs. Pidgeon laughed. "All right," she said. "Now, Tyrone, tell us that in proper grammar." Tyrone grinned. Then he said, "There isn't any pear as big as my hair, because pears are small, but I always comb my hair up to make it look pretty large." I have had this book by for a few weeks now. I know I won't have time to read it cover to cover until summer, but I have spent a lot of time with it over the last few weeks and I wanted to share. 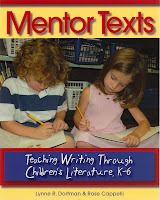 MENTOR TEXTS by Lynne Dorfman and Rose Cappelli is a great book for K-6 teachers who run a writing workshop. It is a big book--almost 300 pages. The authors know writing and they know books well. When I started writing workshop years ago, the two books that had the biggest impact on my teaching were WHAT A WRITER NEEDS by Ralph Fletcher and LASTING IMPRESSIONS by Shelley Harwayne. Both of these books helped me to see the power that books could have for the writers in my classroom. The authors of MENTOR TEXTS builds upon these same ideas and shares more ideas for using great literature as part of writing workshop. The writing is amazing. You can tell that the two authors are great writers so, as a reader, I really trusted what they had to say about writing workshop. The book is organized in ways that helped me think about books in different ways. Samples from students and excerpts from children's books help us to see exactly what the authors are talking about when they share different texts. Lots of lesson ideas are woven throughout the book. An amazing book list shares lots of books that are current and provide a great resource for teacher. I am really excited to spend more time with this book before next fall. I know that it is going to be one that is tabbed and marked up and that I will go back to it throughout the year. I am excited to discover new books and new ways to think about how they may help mentor the writers in our classroom. The text is accessible. The photographs are vivid. The charts and graphs are compelling. Al Gore clearly spells out the crisis, but he begins and ends the book by saying that it is not hopeless. In the beginning he says, "I like the fact that in Chinese, the word 'crisis' is made up of two characters...The first one means 'danger.' But the second one means 'opportunity.' " In the end he points out, "Another big problem with global warming is that an astonishing number of people go straight from denial to despair, without pausing at the step in between. Yes, there's a crisis...but we can do something about it." So what are YOU going to do? Switch to fluorescent bulbs? Turn down the thermostat? Turn off your computer rather than just putting it to sleep? Buy a Prius? Take shorter, cooler showers? Check here if you need ideas. There's a pdf poster of 10 things we can all do. Just today, I got an invitation from Gather.com via American Public Media to join the "Go Green On Gather Contest" for Earth Day 2007. This Earth Day, April 22, make a commitment to live today without compromising tomorrow. Living a sustainable life is easier than you might think—take one step at a time, incorporating eco-friendly lifestyle changes that will make our planet healthier for future generations. It’s never too soon to start! I had a chance to meet Wendy Mass (author of my favorite book of 2006, JEREMY FINK AND THE MEANING OF LIFE) in person last month at Michigan Reading Association (and I am finally having time to write about it)! (This conference is a GREAT one if you ever get a chance to go. Lots and lots of great speakers--professional and children's authors.) What a treat! We met before her session and then I was able to hear her to as part of a Young Authors' Day. She spoke to a group of student authors and their families at a great event sponsored by the conference. It is always great to meet an author who you like even better after you meet them and hear them talk. If Wendy has an official fan club, I am pretty sure that I can now qualify for president. Wendy talked about her journey as an author and shared lots of the writing that had been published in her life. Her goal is to publish a new kind of writing each year. I was amazed that even as her success as a children's book author, she seems to be sticking with this goal--How many different ways can I be published? She has greeting cards, short stories, advertisements, articles and more. Her newest publication is a behind the scenes look at C.S. Lewis. I wasn't aware of Wendy's two books in the series TWICE UPON A TIME. I read the first few pages of each and I'm sure they'll be a hit in my classroom. They are on my "to read soon" pile. My favorite of her publications was one that she read aloud to the group-- "The Fear of Flying," an article in a Society of Children's Book Writer's newsletter. She talked about the need for authors to fly to do author appearances. It was an article I could certainly related to since I hated to fly for so long. In September, Wendy has a new book coming out called HEAVEN LOOKS A LOT LIKE THE MALL. This book clearly calls to me. What a title! She is currently working on a new book. And here is her MySpace page. Here are the states I've visited. On a completely different note, Yahoo! is preparing to launch Yahoo!Teachers. "Get ready! It's coming...The easy-to-use site and peer network designed by and for teachers. Get ready to create, modify and share standards-based curriculum." Like Bud the Teacher (thanks for the link), I'm still a little leery about this (and, no, my school isn't in their network, either). Additionally, BtheT brings up some other details/angles/slants about which I wasn't even aware...Google Certified Teachers? Yahoo Teachers of Merit? Here's a little peer networking: if you need to belong to a group of really smart literacy educators, all you really need is Choice Literacy. Sign up for the free weekly newsletter. You'll see. This has to be ab.so.lute.ly the CUTEST baby picture ever! Can you tell that mom is a member of the Kidlitosphere?!? Congrats, Stephanie (Children's Literature Book Club)! And this fun find comes to you from the lobby of the doctor's office. I was in for a "how many ways can you start to fall apart" kind of appointment on Friday morning. A mother, grandmother, and two little (3 years? 4? I can never tell...) twin boys were leaving just as I sat down to wait. One of the boys approached the automatic sliding glass doors, raised his arms and said, "OPEN, SESAME!" And, like magic, the doors opened. Mom said, "Let 'Other Kid' do these," and the other boy magically opened the second set of doors. Let's not forget that magic is real and alive and it's as close as the doors in the doctor's office. In case you don't walk around with twin preschool boys to show you the magic, you might need to get in touch with your own inner preschooler to find it, but it's there. The magic is there. It doesn't leave when we grow older. We leave it. But it's still there, waiting, any time we're ready to say, "Open Sesame!" Don't you love Poetry 180? The idea of a poem a day for high schoolers, to be read over the announcements, is brilliant. Billy Collins, former Poet Laureate, is brilliant. I have both volumes of the poems because I can just about guarantee that if I open either one anywhere, I can find an accessible and spot-on poem. Which is what I did today. Today's poem goes out to anyone who struggles sometimes to keep up with life, with (school) work, with parenting, with blogging (reading and/or writing), and with all the rest of everything that gets dumped on the plate you're trying desperately to keep balanced. It's for all those times when we wanted to be there, but just couldn't make it. A Year of Reading has been honored by Wild Rose Reader with a poem in our honor today! Check out her poem of address written as a FAX to Pluto, informing Pluto of its demotion from planet to dwarf. It is the perfect companion to an earlier poem that she wrote when Pluto was first demoted. Thanks, Elaine! We have been selected as Thinking Bloggers by InlandEmpireGirl at Gathering Around the Table. What an honor! 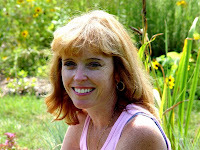 InlandEmpireGirl's blog is full of recipes, gardening tips, thoughts on teaching and writing, and GORGEOUS photographs! Go check it out. Borderland writes indepth posts about education issues and about his classroom in Alaska. PunditMom tackles politics and motherhood. The Miss Rumphius Effect shares great thematic book lists that she uses in her teacher education courses. Julius Lester's A Commonplace Book is a feast for the eyes as well as a place that makes us (and others) think. His "Books That Changed Your Life" series is fascinating. Educating Alice's Monica Edinger is featured today, and she's another blogger that makes us think hard about our teaching and our students' learning. I can already predict that this will be a new favorite during our class's Nonfiction Reading Time. HEY BATTA BATTA SWING! is a great new nonfiction book by Sally Cook and James Charlton. This is one of those longer-size picture books, about 45 pages. The book shares lots of interesting stories about baseball history. The illustrations give you the feel of the old days in baseball. The writing is perfect for kids in the middle elementary/early middle school grades. The narrative is good and easy to follow. The author embeds words and their definitions throughout the books. The subheadings help readers know what is ahead. I have been on the lookout for nonfiction books that invite readers to read cover to cover. So many that I have in my classroom have more of a magazine layout. This one is definitely one that you'd read from front to back. An enjoyable read with lots of interesting new info about baseball! I'm impressed. The lag time between the explosion of graphic novels and ideas for what else to do with them in the classroom besides let kids read them has been fairly short. The NCTE Inbox Blog has information about a new NCTE professional book, Building Literacy Connections with Graphic Novels: Page by Page, Panel by Panel, ed. James Bucky Carter. Unfortunately for elementary teachers, this book is for teachers in grades 7-12. However, the ReadWriteThink lesson "The Comic Book Show and Tell" looks as if it could be adapted for younger readers and writers. Especially nice is the Comic Vocabulary Interactive, which gives definitions and visual examples of text, layout and design, and angles. I'd like to gather multiple copies of BabyMouse books from the library (once again, what would I do without the public library?!?!) and try to adapt this lesson for my graphic novel-obsessed 5th graders. I just finished reading DEXTER THE TOUGH by Margaret Peterson Haddix. I am a big Haddix fan. For starters, she is from Ohio. And I became totally hooked on her SHADOW CHILDREN series. She has written several great middle great books lately--THE GIRL WITH 500 MIDDLE NAMES and SAY WHAT? My very favorite by Margaret Peterson Haddix is BECAUSE OF ANYA--an amazing story about a girl who is dealing with the loss of her hair. So, I was thrilled to see a new book for this age group. Each of Haddix's books for middle readers deals with a real-life issue. The issues all make for lots of thinking and great conversations. Haddix does a great job of writing about issues in ways that are appropriate for students in grades 3-5. She takes on big issues and helps us come to know the character as he/she deals with it. DEXTER THE TOUGH is a short novel--144 pages. Dexter has just moved to a new school. He is having a bad first day. He is angry about his life and we find out, as the story unfolds, that his father is going through aggressive cancer treatment, so his parents have sent him to live with his grandmother during treatment. He covers his pain with anger but grows as he makes a friend. I think this would be great book for a book talk in the middle grades. I am VERY excited about today's release of KIMCHI and CALAMARI by Rose Kent. I read and reviewed it earlier when I had received an advanced copy. As a member of the adoption community AND as a fan of great children's books, I can't say enough about this book. I interviewed Rose to celebrate the publication of this book! Franki: What inspired you to write Kimchi and Calamari? Rose: My inspiration came wrapped in a diaper and drinking a bottle of soymilk, all the way from South Korea. I'm referring to Connor, my third child, who we nicknamed Buddha Baba because of his plump cheeks and glowing smile. Adopting Connor was a true joy and believe me that's how I felt. But I also realized early on that it also involved a primal loss for him. I remember holding him in my arms and worrying about how he would cope later, especially during puberty, a natural time for such reflection. I knew I couldn't spare him from some hurt, but I wanted him to know that I "got it"- that who he was as a person didn't begin the moment he arrived in America. So while Joseph's story is all his own, KIMCHI & CALAMARI came from a place where I wanted to connect with kids reflecting on their identities. And it isn't just adopted kids needing this knowledge; all kids do. I love that old proverb that says children need to know their roots to develop their wings. Nobody cruises through middle school without some struggle to figure out who they are and where they fit in. Franki: What do you hope readers come away with? Rose: Above all else, I hope they enjoy a juicy page-turner that makes them laugh and think a bit. We authors love giving readers a bit of a roller coaster. And I would like kids to relate to Joseph, since he has both unique and every kid qualities. I try not to preach in KIMCHI & CALAMARI - we writers at best are storytellers. Yet I do feel that kids today are pulled in different directions. Because he's adopted, Joseph calls himself an "ethnic sandwich." Other kids feel "sandwiched" by interests, expectations, friend groups, perhaps divorce, different ethnicities, the list goes on. No matter what the pulls, I think kids need to understand that who they are, in all its varying pieces is okay. They are okay. Franki: What kind of response are you getting from the adoption community? Rose: It's been wonderful. Adoption Family Magazine was kind enough to review KIMCHI & CALAMARI this month, and Multicultural Review will be covering it soon too. And I've been able to speak to families at a number of adoption conferences and meetings. The feedback that most pleases me is when adopted kids tell me they related to Joseph -- that he felt real to them. And several adoption cultural camps will be using the book for discussion this summer, and that makes me happy too. Franki: I love how realistic it is. I love how the birthmother search does not stop other things from happening in his life. How did you decide to have it work that way? Rose: Well I know that nothing in families occurs in a vacuum. I'm the mom of four children and stepmom of two children, ranging from 20-years-old down to eight. The same day that one of my older children was experiencing her first boyfriend break up, another was whooping it up over his All Star team win. Meanwhile, dinner was burning and someone else was yelling because he there was no soap in the shower. Life is one big mishmash of joys-struggles-and absurdities all packed in twenty-hour hours at a time, so I couldn't make Joseph's search for his birth parent be the only happening in his middle school life. I did, though, try to show respect for the significance of such a search and what it meant to Joseph. Franki: I believe that books are a great way for kids to make sense of the world. Are there books that did this for your children as they were growing up? Rose: Yes, Franki, many. My older kids still recall many touching books we read together, such as A WRINKLE IN TIME, MRS. FRISBY & THE RATS OF NYMPH, SKELLIG and REDWALL. As a teacher I bet you'll agree that special characters stay with you forever. We hear the term character development a lot in education these days, and I really feel kids learn a lot of the right stuff, if you will, from fiction -- when characters step up, in spite of struggle and do the right thing. This is really topical because my family recently experienced a death of a close friend. This was my younger children's first close encounter with death, and we'd just finished reading EACH LITTLE BIRD THAT SINGS by Deborah Wiles together. My daughter Theresa echoed back words Comfort Snowberger had spoken to comfort herself and her cousin Peach after the deaths of Great-great Aunt Florentine and Great Uncle Edesto. The story gave Theresa strength to deal with her grief. Franki: Your characters are immediately likable and you were able to portray the feelings of all family members and friends realistically when it came to the birthmother search. Was this autobiographical or based on other things? Rose: Thanks, Franki. Well I don't turn my friends and family into characters. They wouldn't like it and I don't think it would ring true. I do, though, try to tap into feelings that are real and relatable, and of course as an adoptive mom that's what I did in KIMCHI & CALAMARI. I've had many talks with people touched by adoption, including adoptees, birth mothers and adoptive parents, and those feelings fed into Joseph's search for his birthmother. I wanted to show that in this search, Joseph was not only looking for his birthmother, but also himself. Franki: The school project was an interesting one. The whole issue started with that assignment. What made you choose that as the main catalyst for the problem? Rose: I'm a great believer in the value of thoughtful school assignments. I remember a teacher-friend assigning an essay to her students at the start of the new year explaining the origins of the student's name. I loved that idea. Not only do these assignments involve writing, but they get kids talking to their parents, beyond the logistical chatter we all experience at home. Of course the ancestry essay represented a sticky point for Joseph who was adopted, but in the end, writing it helped him make realizations about himself. Franki: How did your children respond to KIMCHI & CALAMARI? Rose: My kids would be first to tell you they deserve mucho credit for Joseph's voice, and they are right. I often read sections of KIMCHI & CALAMARI to them, and they'd give me feedback on not only the plot, but also if the voice worked. And you know how kids are; they don't mince words. If Joseph didn't sound fourteen and boyish, they'd shout out "Uggh!" or "That's goofy, Mom!" Now that the book is coming out, they are very excited. It's also been a nice way for my adopted children to continue conversations about their origins. But as with many mothers who have jobs and other responsibilities, Mom the Author is quickly forgotten when Mom the Cook or Mom the Chauffer is needed! Franki: Are you working on any new books? Rose: I'm finishing up a novel about a girl who moves to upstate NY from Texas with her mom and deaf brother to open an ice cream shop. (This is a tasty story to research. :)) And my other work-in- progress is a baseball story, in tribute to the men in my life and their maniac obsession with this game--I live with a Yankee fan, a Mets fan, and a member of Red Sox nation. Now there's true diversity. I just came across two versions of old favorites. There are lots of these out there and I always wonder what attracts me to the ones I purchase. I have a large collection of picture books in my room and a whole shelf full of different versions of various "favorite stories". 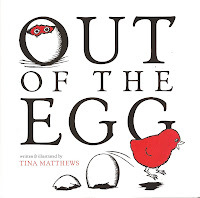 OUT OF THE EGG by Tina Matthews is a new version of THE LITTLE RED HEN. As usual, the Little Red Hen does all of the work (this time planting a tree) and the Fat Cat, the Dirty Rat and the Greedy Pig have no interest in helping. But this Little Red Hen also lays an egg and a little red chick is born. The baby chick teaches his mother a good lesson about sharing. A great surprise ending makes this a great one! 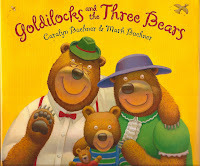 GOLDILOCKS AND THE THREE BEARS by Caralyn Buehner drew me in with the cover illustrations. The illustrator Mark Buehner, illustrated SNOWMEN AT NIGHT, a favorite at our house. The bear family on the cover looks so....friendly. You can tell it will be a great version of this story. The story is basically the same, but this Goldilocks is full of energy and rhyme. When she sees the 3 chairs, Goldilocks says, "Big chair, middle chair, little chair too, Somebody's here to bounce on you!" She proceeds to jump rope on each of the chairs. Goldilocks proceeds through the house with her jumprope. Her facial expressions are worth a closer look. I like this one because it stays true to the story but the author/illustrator team have given it a new energy. I just wrote an article for Choice Literacy about the limits of leveled books. It includes a booklist of great books for new readers if you are interested. Here is the beginning of it. I am going on another diet. Not one of my favorite things, but something I have to do. I know that for the diet to last through all of the weight I need to lose, I need a little variety. I can't eat lettuce, grilled chicken and oatmeal for months at a time. When I have gone on diets without variety, I have always ended up deciding that I'd rather just be a little plump. It isn't really worth it. Poetry Friday roundup this week at Big A little a. Here's another book that would prompt these questions for my students: "Where in the library should this book be shelved? Is it poetry? Nonfiction? Geography? Art?" Wouldn't it be fun to study the way Siebert and Johnson have highlighted, with poetry and art, the 22 states in TOUR AMERICA, and then try to make a supplemental volume that features the other 28 states? Or make a volume specific to the natural beauty, the historical significance, the unique events, and the known (or unknown landmarks) of your state or city? I was intrigued when I read this post by Jennifer at Kiddosphere. (thanks for the link, Jen Robinson!) Jennifer wants to read all of the Beverly Clary books before Cleary's birthday on April 12. It seems that as readers, we set these kinds of goals every day. Fuse #8 has mentioned her goal of reading all of the Newbery books. Years ago, once I realized that I hadn't really "read" any of the classics in high school or college---just got through the classes, I decided to read one Classic a Year. did this for a few years. Then there was Mother Reader's 48 Hour Book Challenge--a competitive kind of goal setting thing. Shouldn't that be coming up again soon? And then, of course, there is the goal that got this whole blog started--Mary Lee and I reading as many great middle grade novels in hopes that we would have read the Newbery before it is announced. My students set these type of goals for themselves when it is part of our classroom talk. They find a series or an author and decide that reading the whole series is a good goal. Or they might want to try a genre that they have never tried. Falling in love with a series or books by a certain author seem to inspire lots of goals. I'm interested in goals that readers set for themselves--just for fun! If you have a minute to share your goals in a comment or on your blog, please do. You cannot ask your students to do what you don't do. NYC Teacher elaborates eloquently on this truth. Don't know how this one passed me by: The E.B. White Read Aloud Award. The Association of Booksellers for Children (ABC), founded in 1984, is a national organization made up of independent children's booksellers and other individuals that support independent bookselling. The E. B. 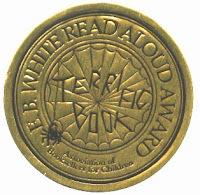 White Read Aloud Award, established in 2004, honors a book that reflects the universal read aloud standards that were established by the work of the beloved author E. B. White in his classic books for children: Charlotte's Web, Stuart Little, and The Trumpet of the Swan. Each year members nominate a list of new books that they believe most embody this ideal, and a committee of booksellers determines the winner. The award is announced annually on the first Monday in April. In 2006, in recognition of the fact that reading aloud is a pleasure to be enjoyed by readers of all ages, the award was expanded to include two categories, The E. B. White Read Aloud Award for Picture Books, and the E. B. White Read Aloud Award for Older Readers. ABC members chose books for distinction based on their universal appeal as a "terrific" book to read aloud. I found this year's winners here. Miss Rumphius has been thinking lots about how and when (and if) we teach science and social studies in elementary classrooms, which books might be best for instruction in these areas (math, too), and the power of letting kids play outside. Before break, my students planted terrariums as a part of their environments unit in science. Every group got the same size container, the same amount of soil and the same kind and number of seeds. Each container got roughly the same amount of light. The variables in this experiment were how they planted the seeds and how much water they gave their seeds. We did observations sporadically and in no consistent format. I told them to date each entry, to write down how much they were watering, and to measure their new plants, but it became obvious that they didn't always take accurate notes. They also experimented with ways to keep their observations: on paper in their Environments Journal, with words in the Memos application on their handhelds, with pictures drawn in the Notepad application on their handhelds, with photos taken with the digital camera on their handhelds, or some combination of methods. When they tried to graph the amounts and dates they had watered the first terrariums, and the growth of their plants, it became clear to them that consistent, regular observations are important if you are going to do anything with your data! After considering the biotic and abiotic factors in their terrariums, the students made plans for new, more successful terrariums to be planted after break. They also insisted on a regular schedule for observations, and we will create an observation form so that they are sure to gather all the information they will need when it comes time to share the results of their new experiment. To give them a bigger example of the fact that science is not a tidy, works-the-way-you-planned kind of discipline, I read Boy, Were We Wrong About Dinosaurs! by Kathleen Kudlinkski. I also want them to know that science is not DONE. There will be lots left to explore and discover when they grow up and become scientists. I also read them A Seed is Sleepy and An Egg is Quiet by Dianna Hutts Aston. I asked them where they thought these books should be shelved in a library: fiction? nonfiction? science? gardens? birds? My students were in agreement that the two are nonfiction because of the inclusion of facts in the captions, but neither is the kind of book you would use to do research. Both books sparked lots of great discussion. At one point I was reminded of Scrotumgate. A student said humans don't have eggs. I corrected him and said that human females do indeed have eggs, and the student interrupted me to say, "yes, in their stomachs." No, I told him, not in our stomachs (that's where we digest food), in our ovaries. At a swift pace to head off any goofy embarrassment, I reminded them that even flowering plants have ovules and ovaries -- we learned that when we dissected flowers in 4th grade. The large picture of a chicken embryo in an egg caused another student to worry that he was eating baby chickens when he ate eggs, so we talked about the difference between a fertilized and an unfertilized egg. And then, thank goodness, it was time for P.E.! About 1/3 of my class is involved in a weekly science enrichment pull-out. The rest of the class is working on a project for our preschool and kindergarten classes. I named the project "I See Science." We are taking pictures of anywhere in our everyday environments where we see science. (After another week or two of gathering pictures, we will create a picture book or multimedia project to share with the little kids.) An electrical outlet (the study of electricity), the geranium (biology), computers (computer science). Last week we took our cameras outside. We saw bumblebees, mud wasp nests, hyacinths blooming, a preying mantis egg case, chickadees, and budding trees and bushes. On the playground equipment, we found simple machines: ramps and pendulums and screws. I think they're getting the idea that wherever you look, you see science! Rather than trying to cram the rest of this year's social studies content into the three weeks after break (before testing), I am going to use historical fiction (Blood on the River: James Town 1607 is our current read aloud), short nonfiction, and some videos and dvds to provide an overview of the remaining topics to build background knowledge that will help me to TEACH the concepts required by the state (after testing) rather than just COVERING the material (before testing). I'm really excited to share a book I found last week at Cover to Cover: Everybody's Revolution: A New Look at the People Who Won America's Freedom by Thomas Fleming. This book is full of great pictures, the text is very accessible, and his premise is perfect for my multicultural, multilingual classroom: What does the American Revolution have to do with me? Fleming highlights the contributions to the American Revolution of immigrants, blacks, Native Americans, women and children. So that's my (rather windy) answer to the study that says we're not teaching science and social studies and our kids rarely get a chance to think. 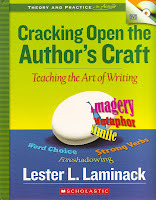 I just received a copy of Lester Laminack's newest book for teachers called CRACKING OPEN THE AUTHOR'S CRAFT: TEACHING THE ART OF WRITING. For those of you who know Lester Laminack, he is a children's author, an author of professional books, and an amazing speaker. Because of this combination, he has written this amazing professional book that allows us to get inside of the decisions he made when he wrote his picture book SATURDAYS AND TEACAKES. Since SATURDAYS AND TEACAKES is such a great book, it makes sense to teach students about the craft of writing using words from the author. CRACKING OPEN THE AUTHOR'S CRAFT digs into Laminack's decisions and gives lessons to go along with several "visual and audible" crafts. Following each lesson, we also get other books that we can use for follow-up lessons on the same topic. Did I tell you the best part? It comes with a DVD of Lester reading aloud SATURDAYS AND TEACAKES and teaching the lessons himself. He tells us at the beginning of the book that the book/DVD set can be used flexibly. As teachers, we can watch the DVD to hear the language Lester would use when sharing the craft. Or, we could just pop in the DVD and have Lester teach the lessons to our students. It is a really unique book and Lester Laminack is one of the few people who has the expertise to do something like this. He is an expert in the field of literacy and he is also a great children's author. The combination allowed him to create this professional resource on writing.